LEPA announces the LV12, a new processor cooler with an all-black finish. Priced at 36.90EUR (incl. VAT), this cooler features four 6mm direct-touch heatpipes, a large aluminium fin array and a 120mm fan that it claims delivers up to 112CFM at a noise level of 23dBA. The HSF measures 138(L)×85(W)×160(H)mm and weighs 460g. With high-end power supplies like the G1600, LEPA has already built a reputation in Europe. Also the chassis and fans of the young brand enjoy an increasing popularity. Now, the manufacturer enters another cooling section: The CPU cooler LV12 is the result of extensive research and development. The engineers designed a slim and compact heat sink which avoids compatibility issues with higher RAM modules while maintaining a high performance capability. LEPA relies on a new technique for efficient air stream conduction: Small air vents improve the air circulation inside the heat sink and increase the heat dissipation rate. The heat pipes rest directly on the CPU so that hot spots can be eliminated quickly. Due to these techniques, LEPA engineers have been able to lower down the thermal resistance of the cooler to just 0.095°C/W. LEPA includes a high-quality PWM fan with the durable "Barometric Oil-less" (BOL) bearing. Thanks to the application of self-lubricating materials, the patented technology allows for a consistently silent operation with 160,000 hours MTBF. Apart from that, you can detach the fan blades in order to clean them from dust and avoid a drop in performance. The 12 cm fan comes with an automatic PWM control and three RPM modes. That way, you can adjust the RPM setting according to your individual system requirements: Silence Mode (800 - 1,500 RPM), Performance Mode (800 - 1,800 RPM) and Overclocking Mode (800 - 2,200 RPM). The stylish matt black coating is not only upgrading the cooler optically, but also protects it from corrosion. LEPA applies a high-tech finish ("Super Thermal Conductive Coating") which makes sure that it does not affect the thermal conductivity and cooling performance of the cooler. The quick and user-friendly mounting system supports all current Intel and AMD platforms. 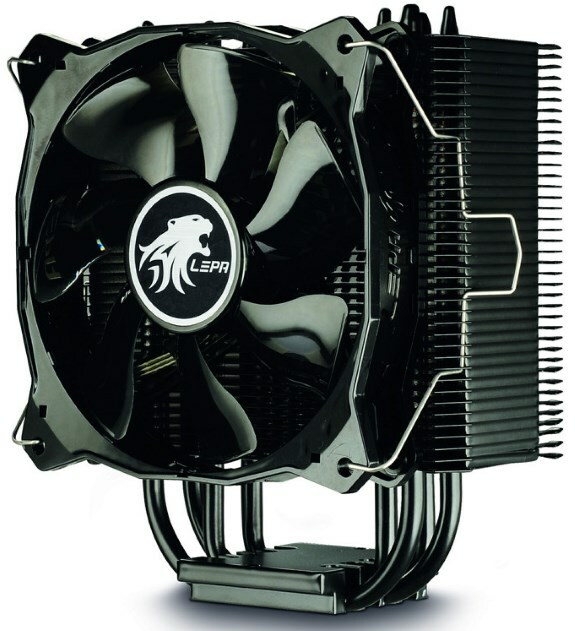 In short, the cooler will be available on sale for a MSRP of 36.90 Euro incl. VAT.